Texas Killing Fields is a movie that should have been a TV series instead. There is way too much going on here for a simple two hour movie, leaving things confusing and unsettled. Based on a true story, Texas Killing Fields tells the story of an area outside of Texas City known as the highway to hell. Since 1970, more than 60 bodies have been found dumped in this desolate area and most of the crimes have never been solved. This film follows the arrival of a New York City Homicide Detective, who has moved to the area and starts investigating a recent series of crimes. If this film had stuck to the story, it would have been terrific, because there was a lot to work with. Instead, the film jumps between three different crimes, in two different jurisdictions, which leaves a team of detectives separated and working on their own things. There is absolutely no background story on the detectives, the victims, the suspects, or the fields, and when the cops are talking to people, it feels like you've missed a whole lot of background information. Everyone knows everyone in these small towns, but the writers seem to have forgotten that we don't know anyone and were left extremely confused. There are a dozen suspect and a new victim every half hour. With each cop working on his own, we are thrown back and fourth to the point where the film becomes unwatchable. Avatar's Sam Worthington stars and as with that film, he's really nothing special. The guy is an interesting side character at best, but definitely not ready to be starring his own film. His partner is played by Jeffery Morgan, who eerily looks like he could be Javier Bardem's twin. Morgan was somewhat better than Worthington, but again the performance was uneven and hard to judge, because it was simply impossible to keep up with what was going on. 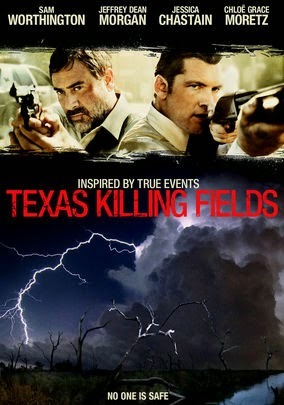 Texas Killing Fields had a real life story to play on, but too many good ideas for it's own good. The producers try to pack in as much as they could into 105 minutes, which wasn't enough time to tell the story, and left the audience scratching it's heads.